CRDC is pleased to announce it assisted in the financing of Bunny's Convenience in Downtown Manchester. This is Pramod Nyaupane and his wife, Bibhuti Thapa's, second location who together also own Bunny's Superette located on Webster Street in Manchester's North End. The new location on the corner of Elm Street and Amherst Street underwent renovation before the grand opening. The former CVS building is now Bunny's Convenience occupying nearly 5,000 sf with storage in the basement. The second floor renovations and usage will be determined in the future. "We are very pleased with CRDC's involvement and assistance in getting us to this second location," said Pramod Nyaupane, owner Bunny's Convenience. "Once financing was approved we moved quickly to start renovations and get to our Grand Opening date." "This is a great second location for the Bunny's brand," said Jennifer Boulanger. "Not only does this fulfill a need in downtown Manchester while creating several new jobs within the next few years...it also nicely re-uses a formerly vacant building." CRDC and Primary Bank worked together to finance the property. The loan was financed under the SBA 504 Loan Program and was combined with funding through CRDC's Direct Loan Program. 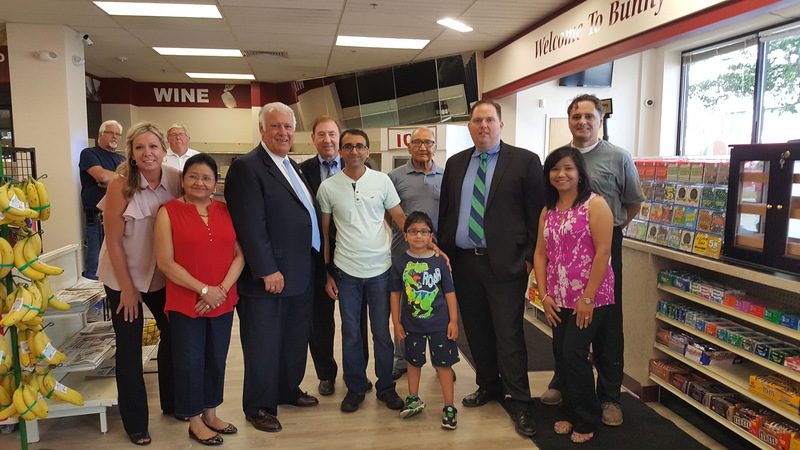 (L-R) Joseph Bator, Exec VP & Senior Lender at Primary Bank, James Goodhue, VP Commercial Loan Officer at Primary Bank with Stephen Heavener, CRDC's Executive Director, Pramod Nyaupane, Bunny's Convenience Owner, Manchester Mayor Ted Gatsas and Jennifer Boulanger, CRDC's Loan Officer.